On the surface, Astro, launching its public beta today, is a nifty but not completely necessary email client that combines machine intelligence and a bot interface to improve workflows and increase the signal to noise ratio of mail for power users. But the real story is that the startup, backed with a new $8 million Series A led by Redpoint, is gearing up to pitch enterprises on its collaboration platform that combines AI, social graphs and integrations with common CRM, ticketing and group messaging tools. Astro, evoking images of Jetsons-era futurism, is a standalone mobile and desktop client for email. It has all the bells and whistles of a high-end Gmail replacement — think snooze, send later, priority inbox, unsubscribe and custom notifications. 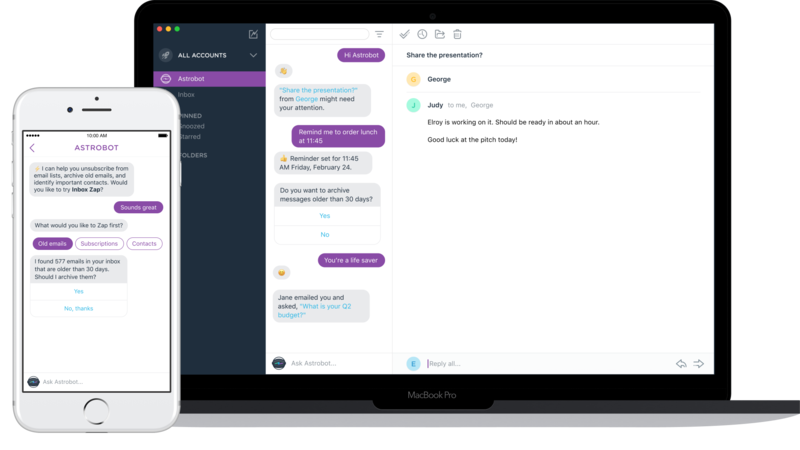 But in the face of the bot-pocolypse, Astro is trying to sell users on the idea of an email bot that can act as the conversational interface for many common workflows like archiving messages and setting reminders. The reality for Astro and its competitors is that new email solutions crop up and fail faster than we can learn to accommodate them into our workflows — we’re still getting over the death of Mailbox. But Astro plans to supplement its revenue in a very serious way by servicing enterprises, Slack style. Astro is launching its public beta today to get the email client into as many hands as possible. As the company builds partnerships with hypotheticals like Atlassian’s JIRA, Salesforce and Github, the value of the bot interface will increase. Instead of offering up information that could otherwise be gleaned from a quick inbox glance, Astro will use web APIs to aggregate intelligence and push it to people within their inbox, without forcing a new and awkward process on users. In the spirit of LinkedIn, Astro built a social graph that enterprise teams can use to find connections to avoid the dreaded cold email. The platform keeps tabs on the emails sent by colleagues and can recommend common connections to use for warm introductions. And because tasks within email occupy a majority of most workdays, there’s arguably few places better to capture copious data. Satish Dharmaraj, partner at Redpoint and investor in Astro, explained to TechCrunch that he empathizes with the anxiety generated around bot investments, but that Astro can work because it works to tackle a specific problem and has the potential to measurably improve productivity. The fact that Astro’s founders Andy Pflaum and Roland Schemers collaborated with Dharmaraj on Zimbra, which initially exited for $350 million to Yahoo, sure can’t hurt. As it pushes into enterprises, it will run up against startups like Nimble, which just raised its own $9 million Series A, with a similar thesis around reimagining the rolodex. The Astro team will have to be prepared to make a hard sale against Salesforce’s RelateIQ, and other Slack-centric options. And while Astro is intuitive to use, it’s fundamentally a standalone product vying to stand out in a sea of consolidated enterprise platforms. Astro’s $8 million Series A also included Aspect Ventures, Harrison Metal and Upside Partnership in addition to Redpoint. The beta is available directly from the Astro website, though it now appears to have filled and become a waitlist.